April 6, 1933: Prohibition partially ends—and Fitger’s is ready. On this day in Duluth (and throughout the U.S.) in 1933, Prohibition was partially ended—and Duluth’s Fitger Brewing Company was ready for the future. Weeks earlier President Roosevelt signed the “Beer Bill,” allowing for the brewing and sales of beer containing no more than 3.2 percent alcohol. State and municipalities quickly followed suit. Fitger’s had been gearing up since early March and was prepared to bottle 3.2 beer under its “Natural Beer” label. Because Fitger’s had stayed open through Prohibition making near beer (and other beverages), all the machinery was in good operating condition, making retooling easy. And they had never stopped making near beer, which was created by first brewing strong beer and then boiling off the alcohol—so all they had to do was to not turn the beer into near beer. The gate to the Fitger’s yard was locked up at 6 p.m. on April 5 to make sure nobody tried to break in prior to midnight. Empty trucks were lined up in front of the brewery two abreast between Fifth Avenue East and Seventh Avenue East. Additional trucks were locked inside the brewery yard awaiting the signal to be loaded. The beer parade started promptly at midnight. Police Sergeant Elmer Stovern fired a pistol as the starting signal and the gates were unlocked. 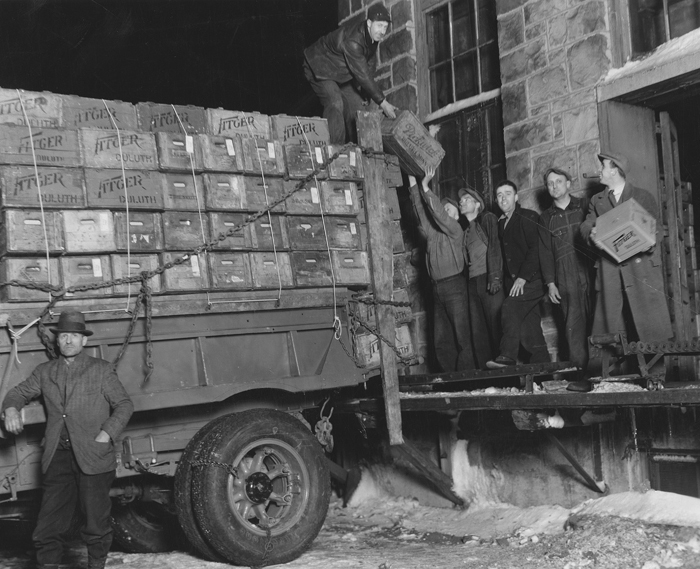 A German “Oompah” band immediately struck up “Happy Days are Here Again.” Brewery workers loaded 147 trucks after midnight; the first, driven by Tim Belland, was destined for Two Harbors. On that first day Fitger’s sold 19,000 cases and 1,260 kegs of beer.